The end is drawing nigh. And by the end I think I mean the beginning, or possibly the middle. For the past week or so, we’ve been cleaning and painting in preparation for actually moving into the farm. Now, we don’t have the whole house yet, as the previous occupants are storing some of their belongings at the ranch until they can have them moved (their new home is still under construction), but we do have most of the upstairs at our disposal, and, given that just the upstairs of the new house is more than twice the size of my present home, I think we can manage. 2. Clean and Functional Kitchen. 3. Clean and Functional Bathroom. I have attempted a cursory cleaning of the whole upstairs, but the living room, for example, won’t really be cleanable until the window is replaced. 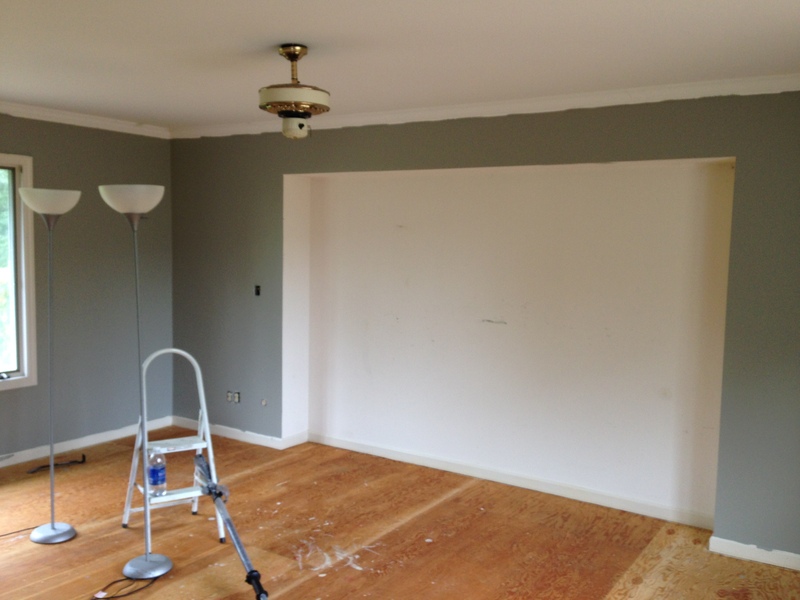 (We’re thinking the contractor will be getting back with us today on that…) Plus, at the moment, it’s where we’re putting all of the other furniture as we clean other rooms. 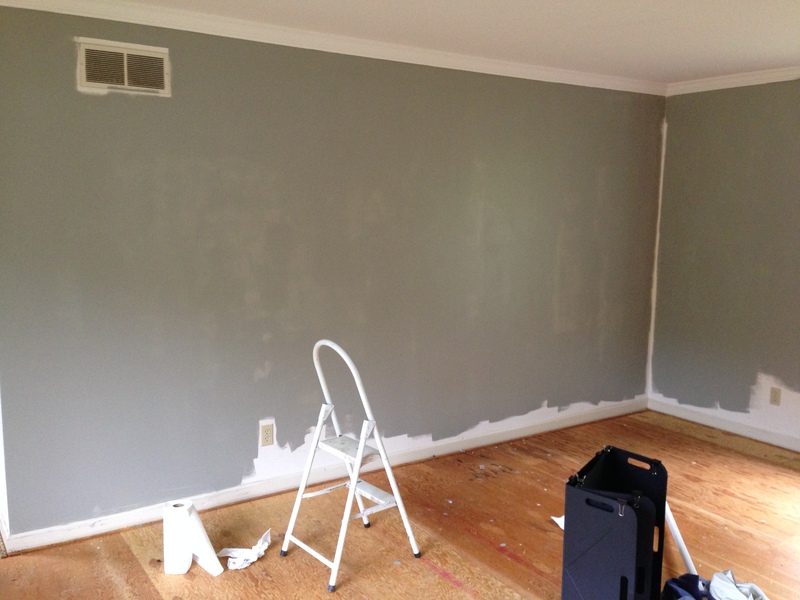 Anyway, about a week or so ago, I undertook the project of painting our new master bedroom. It’s 300+ square feet all on its own, so it was no small task. If I’m being honest, I’ve had the primary paint color for over a month. It’s just one of those projects that I really didn’t even want to start. Down the hall out of the bedroom. The above pictures were taken several months ago. I think it goes without saying that there is a ton of potential in the room. For one, it’s huge! There is a ton of natural light. It takes up the entire end of the house. It also needed a lot of updating. The carpet, original to the house I think, had to go. 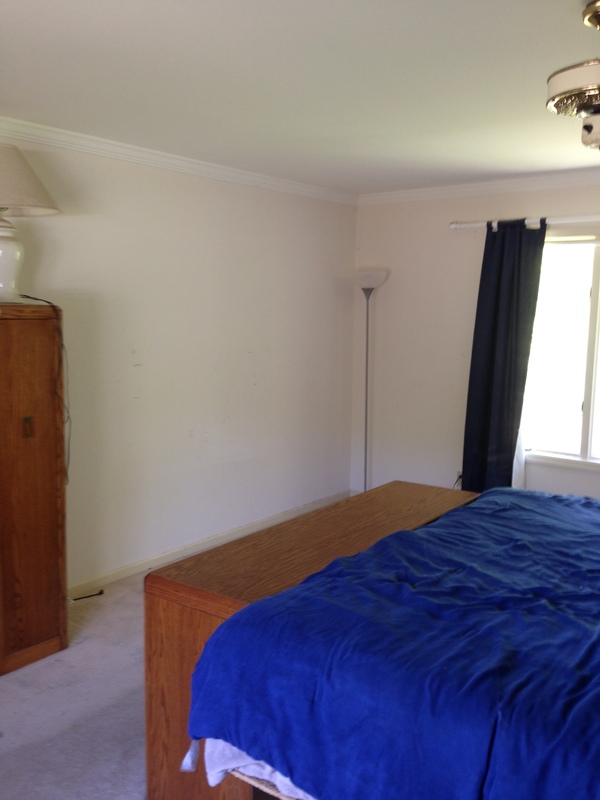 The previous occupants left the furniture you see in the photo for us to keep if we wished. The walls, white throughout the house except where there is wallpaper, needed an update. So, last week, I started updating it. I should tell you, once upon a time, I enjoyed painting. 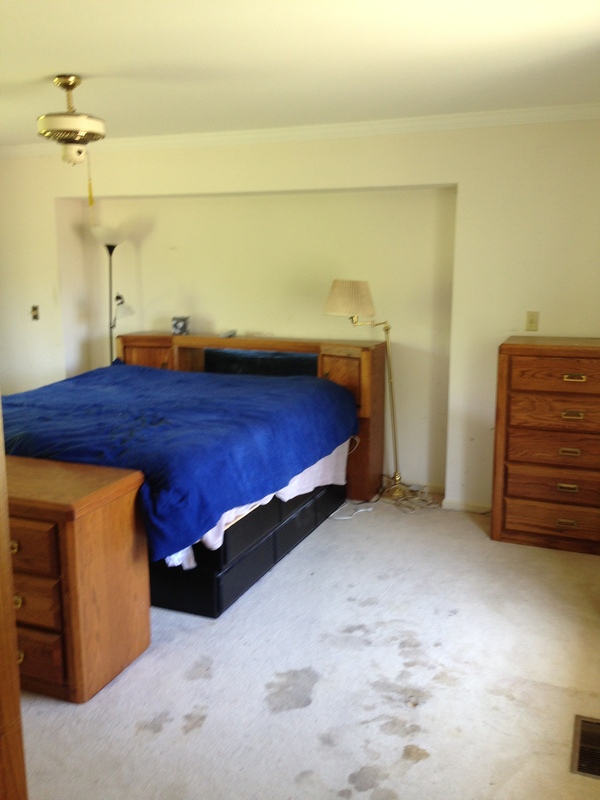 My experience thereof was mostly a room here and there in my parents’ house or a room or two helping out a friend. Then, Jeremiah and I bought our first home. 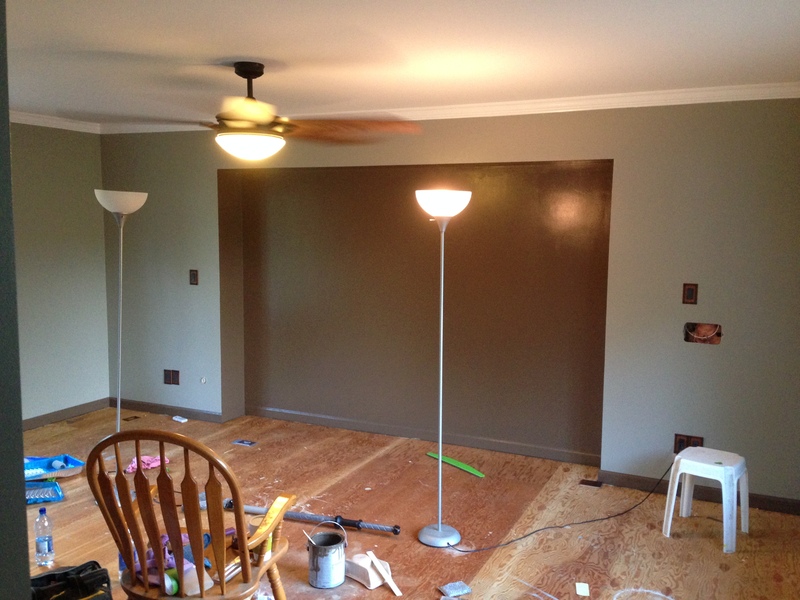 It’s only 800 or so square feet, but we basically painted every single room. That was only three and a half years ago. I don’t like painting so much anymore… But over the last few weeks, I’ve realized that painting is an emotional process, as well as a physical one. It’s almost cyclical, really. Somewhere between the first coat of “Beach” on that first wall and the last coat of high gloss white on the crown molding, I’ve come to realize that there are definite stages of painting. During Stage One of painting, everything is coming up sunshine and roses. It is during that stage that you congratulate yourself. Paint that had been in a pail is going on the wall. It’s a step in the right direction. You are doing it! You’re awesome. Go you! Not only are you being productive, but you have excellent taste. 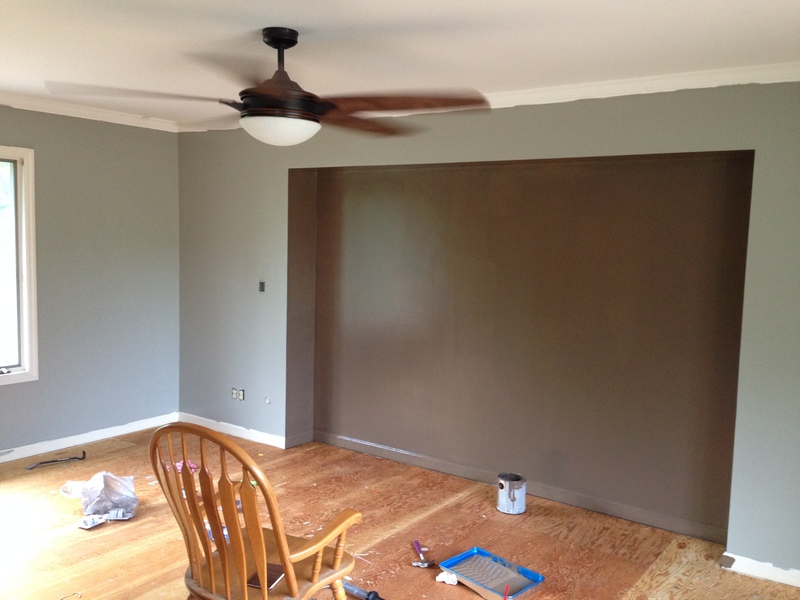 Not just anyone can pick a good paint color. (We’ve all been to those houses where someone else’s “sunny yellow” looks more like “dehydrated urine”…you know what I’m talking about.) But you? You picked “Beach” grey from a myriad of other greys. And “Beach” grey, it appears, is probably the best grey in the history of ever. Stage Two moves past the initial self-congratulatory stage and into tedium. You’re bored. Also, you’re pretty sure gnomes have come in the night and have slapped white paint up where you had painted grey. Beach grey, to be exact. Though, now that you’re looking at it, you’re not sure it’s quite so “beachy.” How do they come up with those names, anyway? And seriously with the gnomes…you are sure you had more done. And what was wrong with white, anyway? Other than the vaguely clinical feel it had…you can totally deal with institutional white for the rest of your life, right? Right? And he comes over, and he slaps a second coat of paint up way faster than should have been humanly possible. As you look around, you briefly revert to Stage One. Wow – look at that; two whole coats! Looks pretty good if you do say so yourself. Totally Beachy! You are a master of paint choosing! And it wasn’t THAT bad. You are practically done. 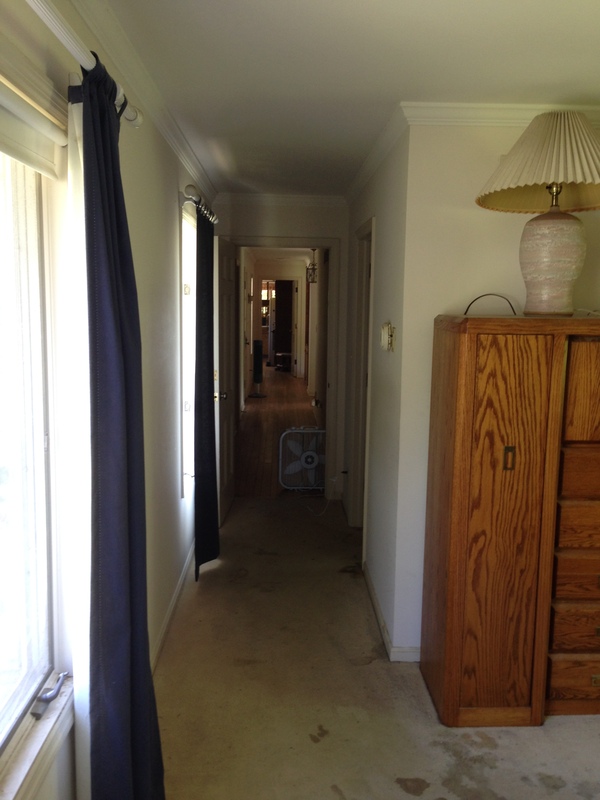 Except for that bump out wall, and all the trim, and the baseboards, and the crown molding. You start to look around at all the detail work, and the optimism vanishes again. You may never finish this. Between the detail work and the gnomes, this will probably never get done. It is with a sigh that you choose your second color. Your “accent” color. You pick something with a coffee name. MMMMM…coffee. You totally need coffee. Coffee would probably make everything better. You briefly wonder if you picked the color solely because you’re tired and need coffee. It doesn’t really matter though, because you will NEVER, EVER finish. For some reason, I decided this needed to be a different color. The ceiling fan changed. That is one of the things the boy was working on while I painted. The coffee color looks pretty darn great. You realize that it would look fantastic on the baseboards! And the trim! And who cares if it’s a super dark color with no room for error? You’ve totally got this! Stage five doesn’t last very long. You move almost immediately into stage six. Regret. 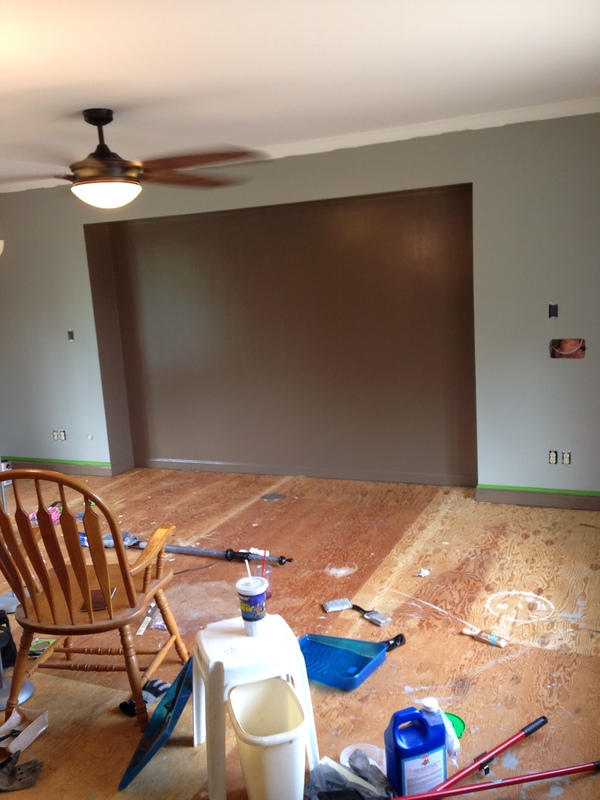 Note the newly painted baseboards. The trim is nearly finished. Then the unthinkable happens. All is takes is one poorly applied piece of tape above the window frame. That line is crap, and you flip your lid over a paint line that follows a poorly applied piece of tape (the one and only piece of tape stuck down by your poor, unfortunate husband). It’s on the last freaking piece of trim before the crown molding! You are very lucky that no one else is there because at this point you would probably be institutionalized. You are especially lucky that your husband is no where to be found, because the rage that is burning within your soul is completely unreasonable. You need a moment to quell it…and to fix that freaking paint line. You call it a day because painting is no reason to turn into the Hulk. You are now a pro. 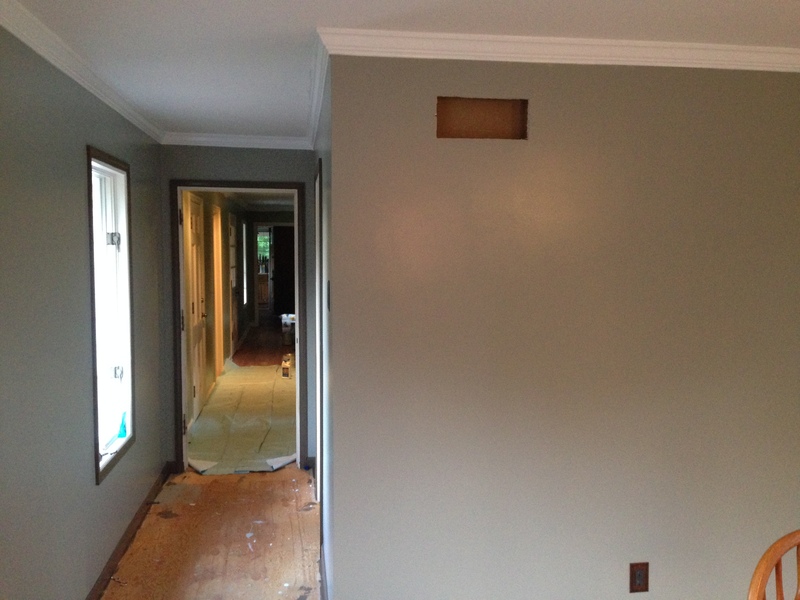 The tape below the crown molding is almost perfect, and it has been applied as one consecutive piece. You slap it up in minutes. And even your husband, who you are no longer unreasonably furious with (luckily that passed quickly and internally) is impressed. Two coats of high gloss white go up without much issue. And, amazingly, you are done. Seriously. You are done. It is finished. You thought this moment would never come, especially with the gnomes. But it’s here. But, if you’re honest, you feel very little satisfaction. Just relief. You are so relieved that you don’t even mind that you got white paint on your favorite Doctor Who t-shirt. Previous I fought the farm and the farm won. Haha…love this! The room looks great! Cherity, you are so funny. I am gonna need to come visit you two to see all of this in person. And yes, I will help paint/do chores, not only because you’re family, but also because inside I’ve always been a farm girl. I guess the apple really doesn’t fall far from the tree, eh? Reminds me that of one of my goals in life: Do not paint the house. Mine is slightly different. Paint the whole house and never do it again. Actually, it’s the sub-floor, so the paint doesn’t matter. (Did that on purpose.) Problem with taking the trim off is that it was put on so well that it would only come off in tiny pieces. I was rather stuck working with what I had. 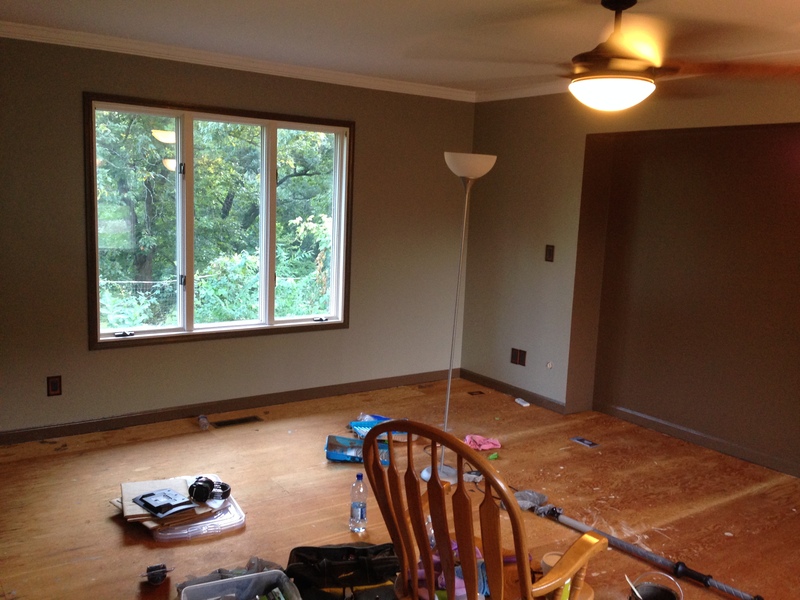 When we moved in we had to paint every room in the house in less than a week and then put down wood flooring the following week. many, many breakdowns on my part. The we stained a cement floor, it didn’t take and we’d already already painted the walls yellow. Disaster when the machine to clean the floors splattered brown stain everywhere! Your room looks great! Thank you! It turned out very nicely. I was pleased.